For those who have decided to make Thailand their long-term (or semi-long-term) home, there’s always the issue of balancing your visa type with the frequency you’d like to leave the Kingdom. And while it’s not the most exciting topic, I know that the visa re-entry question can cause plenty of confusion. To simplify your re-entry permit process for easy travel in and out of Thailand, I’ve compiled this helpful guide that will help you determine if, when, and how you should apply for a re-entry permit in the near future. Is the clock ticking on your time in Thailand? Read on. If you’ve made the move to stay in Thailand for an extended period of time, you’ve likely already gone through a lengthy process to obtain a visa of one kind or another. And, as you probably know, entering and exiting the Kingdom without the proper measures in place may invalidate your current visa, leading to a lot of headaches, paperwork, and payments at border control. Fortunately, a Thai re-entry permit, stamped on your valid visa, allows holders to travel in and out of Thailand without jeopardizing the validity of their current visa. Note that if you need a re-entry permit and do not get one, your visa will no longer be valid. Because the Thai immigration process is a bit convoluted, the re-entry permit eligibility is as well. If you are a tourist and the holder of a Single Entry Tourist Visa or a Single Entry Non-Immigrant Visa, you require a permit. If you have gone from a Non Immigrant O Visa to an extension based on marriage, which permits you to stay in Thailand for a year without leaving and requires 90-day reporting, then you will need a re-entry permit when you leave the country to ensure the extension remains valid. If you are on a retirement visa extension, you will need a re-entry permit to leave and return while keeping your extension valid. If any of the above apply to you, you can obtain a re-entry permit and simplify your travel in and out of the kingdom. You won’t need a permit if you have a Visa On Arrival or a Visa-Exempt Stamp from specific countries. You won't need a re-entry permit if you’re in possession of a Multiple Entry Tourist Visa or a Multiple Entry Non-Immigrant Visa. Are There Different Types of Re-Entry Permit? Yes. Eligible applicants can apply for either a single re-entry permit or a multiple re-entry permit, depending on their current visa status and their travel requirements. If you obtain a single re-entry permit, be warned that you’ll be able to leave and re-enter the kingdom once with the stamp on your current visa. Any time you need to leave the country again, you’ll have to apply for another permit, which will cost you 1,000 THB each time. If you’re planning on leaving and returning to the Kingdom more than four times a year, a multiple re-entry permit is certainly more cost effective. What Are the Requirements for a Re-Entry Permit? You’ll have to go to your local immigration office or the immigration counter at an international airport in Thailand. Be sure that you bring your boarding pass (at the airport), a 4×6 cm photo of yourself, a completed TM.8 form, photocopies of all of your documents (including your passport photo page, your current and valid visa, and your TM.6 departure slip), and cash to pay for the permit. What Is the Cost of a Re-Entry Permit? Those applying for a single re-entry permit must pay 1,000 THB. Those purchasing a multiple re-entry permit will pay 3,800 THB, making it the more cost efficient option for frequent international travelers. What Are the Benefits of a Re-Entry Permit? Whether you’re an avid adventurer, you have an international family, or you’re chasing opportunities in neighboring countries, there are numerous benefits of a Thai re-entry permit — namely, that your visa will still be valid after you’ve left and re-entered the country. Tourists will find this especially helpful as the re-entry permit allows them more flexibility than their original visa may have offered. Those teachers, students, and retired expats who are looking to travel or pursue opportunities in different places will now have the opportunity to do so easily. And finally, the re-entry permit is a fantastic resource for emergencies. If you need to leave the Kingdom quickly to deal with an issue, but don’t have the time to pack up your entire life and leave suddenly, a re-entry permit is invaluable. Those who have gone through the hassle of applying for a visa will know that any stamp allowing them to escape a voided visa is a great option. Where Do I Apply for a Re-Entry Permit? If possible, prepare your application for a re-entry permit ahead of your trip! Bangkok’s Division 1 Immigration Office in Chaengwatthana is open to those seeking permits Monday through Friday, 8:30 am to 4:30 pm. Those based in Thailand’s northern city of Chiang Mai should venture to Promenada Mall for their permit; the location is open Monday through Friday, 8:30 am to 4:30 pm. Those living in the tropical paradise of Phuket should head to the main immigration department in Phuket Town, which is open Monday through Friday, 8:30 am to 4:30 pm. Can’t make it to one of the major cities? Don’t worry: there are plenty of Thai immigration offices in airports across the Kingdom. You can use this map to find your local department. As mentioned above, you can also apply at one of Thailand’s many international airports. But be forewarned: when applying at an airport, you must be flying out of the kingdom on the same day that you apply for a re-entry permit. So get to the airport in plenty of time. 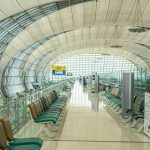 At Bangkok’s Survarnabhumi Airport, you’ll need to arrive at least three hours early — going through immigration could take as long as 45 minutes. Head to the immigration section of the departure halls; the booth is open 24 hours a day. Because this is a last-minute process, you may have an additional administrative fee tacked onto your permit charge. Expect to pay at least 200 THB more. You’ll have an easier time at Bangkok’s Don Mueang Airport, where processing a re-entry permit may take as little as 10 minutes. You can find the immigration counter after the passport control station — it’s also open 24 hours a day. If you’re heading out of Thailand’s Jewel of the North, you can get your re-entry permit at Chiang Mai International Airport, in the international departure zone. For those departing from Phuket: there has been a lot of contention as to whether or not travelers can obtain a re-entry permit from the Phuket Airport. Be safe and get it from the immigration office in Phuket Town instead. How Long Does It Take to Process a Re-Entry Permit? You never really know quite how long your permit processing will take, so be sure to dedicate at least a few hours to the process. If you’re visiting your local immigration office, your permit will likely be validated between one to six hours. You may want to drop the documents off and come back at the end of your work day to avoid standing in line. At the airport, the process will likely be much quicker, but you should also leave a substantial amount of time before your flight in the event that it isn’t. Immigration experts recommend arriving at least three hours prior to your flight’s departure, if you’re looking to obtain a re-entry permit before flying. You may also want to call the immigration departments of your local airport to see if they can provide any information about the wait time that day. How Do I Use a Re-Entry Permit? When you re-enter Thailand with the permit, make sure that the immigration officer knows you are in possession of it by either opening your passport to the re-entry stamp or by pointing to the visa. If the immigration officer misses the stamp, your visa will be revoked and you’ll be responsible for paying the 500 THB-per-day overstay fee, so take care! When returning to the kingdom, always write your re-entry permit number on any immigration forms or questionnaires. This will ensure that everything runs smoothly. Now that you’ve gotten your re-entry permit, you’re free to travel in and around Southeast Asia — and beyond — without the fear that your life in Thailand will be disrupted! Got any questions or comments about the process? Leave them in the comments below. I had returned to Myanmar from BKK through Don Maung Airport and stamped a single re-entry. I will re-enter to BKK on 27th April. After re-entering into BKK, may I need to report within 24 hours or report as a 90-day report after 3 months? What visa do you have? I am an Indian passport holder going to Bangkok directly with Single entry visa on 1st October. Then I will go to Cambodia for 3 days and again will return back to Bangkok on 7th through Flight to BKK airport. Now, what is my options?1. Can I take a re-entry permit from Immigration Office in Chaengwatthana before my travel to Cambodia?2. I go out from Bangkok on 3rd to Cambodia and return back to BKK airport on 7th and go for a Visa on arrival. In this case, will I be allowed to take a flight from Siem reap to BKK (I am not holding thai Visa that time) or I have to travel by land to enter Thiland from Cambodia and apply for visa on arrival at border? Let's assume I have a retirement visa And a re-entry stamp. 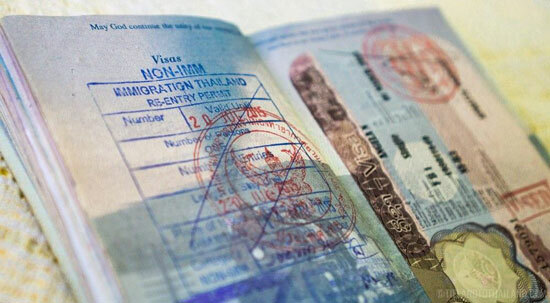 How long can I stay outside Thailand and still be able to re-enter using the re-entry stamp? If more than 90 days, what about the mandatory 90 day reporting requirement? Is that simply waived while I'm outside Thailand. Thanks for your advise. I'm considering retiring to Thailand but I may need to return to Australia for a seven month period. My friend and I left Thailand last week and we wish to re enter on the 10th of may but we only have a single entry visa for 30 days ( we landed in Thailand on the 18th March). Can we obtain a re entry Vida from the Thai embassy in Hanoi? You can't get a re-entry permit once you have left. Just re-enter and you'll be given 30 days again. I arrive from SINGAPORE at DMK, my return flight is from SUVARNABHUMI .On 7TH MAY 2019 will I get a RE entry permit AT DMK? You won't get one automatically. You only need a re-entry permit if you have a single entry visa (see the post details) and plan to leave the country and re-enter on the same visa. The re-entry permit keeps the visa valid. If you're just coming for a holiday and entering on an exemption stamp you won't need a permit. The re-entry permit will only be valid if the current visa is valid. Hi there, are you able to confirm if Chiang Rai airport can process a re-entry permit purchase, or do we have to go to immigration or do it in Bangkok? Thanks! Re-entry permits are only available at airports if you are departing from that airport on an international flight. It would be best to go to immigration. According to the rules, yes you can get a re-entry permit. But do check with the embassy in San Jose before you leave. Any Idea where I can find the TM-8 form online? The link on the Thai embassy website doesn't work. Swasdi krap...I'm in Vietnam, my flight back to Canada departs Bangkok at 0630k Apr 33rd. I need to overnight in Bangkok, only stay in Bangkok for about 14 hrs. Do I need a visa re entry into Thailand to catch my flight home? Jim, BKK has an overnight lounge called the Miracle Transit Hotel. You'll probably have to pre-book but then you won't even have to clear into the country. If you've got checked luggage see if you can arrange a transfer to your CA bound flight otherwise you'd have to get stamped in under Visa Exemption, go back upstairs and check out. You can book direct or through Agoda. I arrived thailand on 19th Feb on NON IMMI B visa (90 days validity) for Employment,The visa is valid till 19th May. My company will extend it for 1 year on 19th April. I want to go to India during 13-16th april and come back on 17th april. Am i eligible to get the reentry permit ? Thanks. Same kind of a question. Planning to land in Phuket and leave Thailand in 5 days from Krabi with an onwards journey to Philippines and retun after 10 days from Philippines to Bankok and leave Thailand after 4 days.Would any of it be a issue? Would I still come under a single entry visa on arrival slab? Do you see any challenges here? I am an Indian too and will be travelling with my companion. You need a re-entry permit if you have a single entry non-immigrant visa. If you are arriving on an exemption stamp for 15/30 days then you won't need one; just come in and go out, and then come in again. My retirement visa expires the end of March 2019 if I travel to the US with a reentry permit and come back in mid April , Will the reentry permit extend my visa or will it be void ? The re-entry permit doesn't extend the visa, it just ensures it remains valid once you re-enter. If you plan on re-entering once your visa has expired, it's pointless getting a permit. Hello! Im from Mexico and I will be in Thailand traveling around. Im flying from Chiang Mai to Hanoi and I want to ask for the re entry, my flight will be on 28th April that its Sunday. Can I go to Promenada Mall requesting my re entry on Friday and flight on Sunday without problem? Or is there any chance to get the re entry at the airport?Thanks a lot! You should be able to get it from the Mall on Friday, within a couple of hours. If not, you can get one from the airport, but make sure you get there early. Your should report to the immigration bureau near the Chiang Mai airport. It is no longer located at the Promnada. It was relocated back to its original location. That is where you will get your re-entry permit. I hold one year Non-B visa with multiple re-entry permit. My visa is expiring on Jan 26, 2019 but my company asked me to do extension on Jan 15, 2019 together with other staff. I need to travel out of Thailand on Jan 19 and back on Jan 21 (before my visa expiry date). When I extend visa every year, I am always given one month consideration period and only after that period, I get one year visa (actually 11 months because 1 month consideration period is counted in one year visa duration). My question is - once I do extension on Jan 15 as my company asks, will my current multiple entry which is valid until Jan 26 will become invalid and do I need to apply for a re-entry permit for my leaving on Jan 19-21? Please advise. If the visa you have at the time you need to leave the country is multiple entry then you don't need a re-entry permit. Great article!I would like to add that above you focus much on the cost of single vs. multiple entry visas. There is another important aspect: re-entry stamps (and visas) fill up your passport quickly!To come to your cost aspects: in my country a 48 pages passport cost 120 Euro. That equals in 2,50 € p.p. (i.e. 100 THB) paasport pages cost. Hi I am issued with a single entry tourist visa on December 15th, 2018 and it is valid for 3 months. I plan to travel to Thailand on 23rd December 2018 and return on 29th December 2018 but I will be coming back to Thailand on 29th of January 2019 again. My question is: I will apply for the re-entry permit on the 29th of December 2018 when I return from Suvarnabhumi Airport, so when I apply for the re-entry permit what will the time allowance I will get to enter Thailand again? Will they give me 1/2/3 months time to enter the Kingdom or will they follow the validity time of the visa I got which is valid till March 2019? Will I get enough time so that I can enter a month later from the date I depart? I think your best (and cheapest) option would be to enter in December on your existing visa and then after you leave get a new visa. Not sure where you are, but in the U.S. that total cost would be about US$80. Just a reentry permit from Thai Immigration costs over US$100 now. Plus you'll have to spend a day in Thai Immigration. My Thai re-entry visa valid until 20 December 2028. Now problem is I wat to visit Bangkok in 18 December 2018. Now what will I do?That time visit possible or not? as many as you want within 1 year. You get 90 days per stay so roughly you get to do about 4 in outs within the 1-year validity of the visa. now what with the new law? how can you get a visa without the money in the bank. i have lived here almost 5 years. my son is here and grandchildren. i am a 79 year old widow. i am 5000 bt short a month. Dear Lynn, I suppose that if your 5000 THB/month short on your retirement money, you have to show a bankaccount with 60000 THB (5000 x 12) on it. Hi Sunil, The 30 days that you get is provided without a visa, so there is no need for a re-entry permit of any kind when you leave. As you assumed, when you re-enter the country you will get another 30 days. However, if you leave and re-enter over a land border then you may only get 15 days. It's really easy to get a tourist visa, though. A single entry tourist visa will give you 60 days stay. A multiple entry tourist visa would give you 60 days stay, but a six month validity, which means that you could stay for 60 days and then leave and re-enter and get a further 60 days. You could do this again until the six-month visa expires. You can also extend for a further 30 days inside Thailand for a fee of 1,900 Baht. Thanks very much for the quick and perfect answer. I was a bit worried they needed it filled in . Hi, Thanks for keeping the useful tips flowing and helping the rest of us to hopefully travel a little more smoothly. I have a question which relates to filling out the T M 6. I am arriving in 2 weeks time on a 60 visa with the intention of obtaining a retirement 1 year visa shortly afterwards. As far as filling out the departure side of the TM6 do I leave it blank or is the something I should put in there as I obviously hope to stay for the year and if successful might visit local countries before any future uk visit . Any advice ? Hi Gary, you can leave it blank. I always do and I've never been asked to fill it out, except on exiting the country, obviously. Even if you did fill it out and your plans change due to the extension, you can just pick up a new one on the way out of Thailand.